The Grid 101 iPhone, iPod Touch, and iPad app is a challenging, unusual puzzle game. There are four game modes that force you to think about shapes, colors, patterns, and movement simultaneously. Two of the game modes function well, but, unfortunately, the other two game modes suffer from unsuccessful gesture controls. The game is definitely worth the try now, but hopefully future updates will address the gesture control issue and improve the game. The Grid 101 iOS app is a universal download, and I would recommend playing the game on the iPad until you get the hang of it. 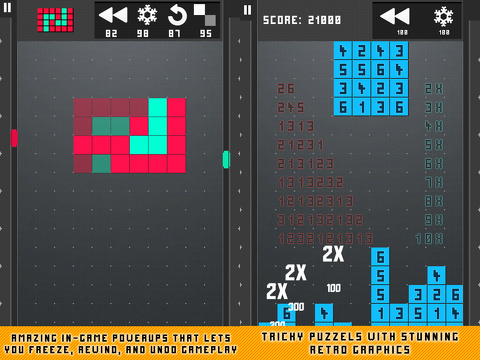 The Grid 101 puzzle iPad game is a tough game, and the larger screen gives you more visual space to solve the puzzles. All of the game modes are played on a graphic of a matrix grid. For each game mode, there are handy pop-ups to lead you through the gesture controls and tips for success. 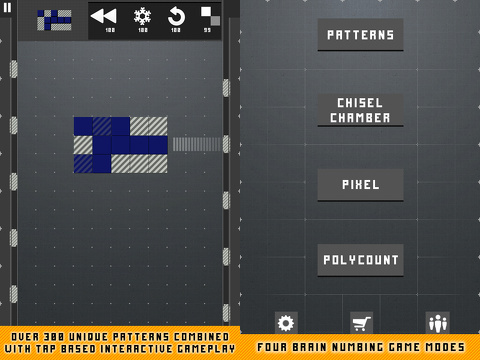 The first Grid 101 iPad puzzle game mode is called Patterns, and it is the easiest to play. There are five color patterns at the top of the screen, and you select one to create. You will find a color on each side of the screen. You tap the color to shoot it into the moving grid in the center of the screen. Then, you tap it to turn the pattern, so you can shoot from the other color when necessary. You are trying to create the pattern before it reaches the bottom of the screen. You must coordinate your taps on colors and taps on the grid, so your puzzle is constantly changing. You must rethink your strategy with every tap on the screen, since you cannot shoot a color through another. You can undo, rewind, freeze, and get hints for the pattern to help you, but you will be penalized with points. The Chisel Chamber is the second game mode, and the object is to shoot a pattern into a fixed position on a grid. Instead of working with colors, you are shooting patterns from each side of the screen into a patterned grid. The same gesture controls and strategy are required to find success. The Pixel and Polycount modes are interesting, but the inaccurate gesture controls are frustrating. With these modes, you start with a patterned grid instead of creating one. In the Pixel mode, you try to connect colors of blocks together, so they will dissolve. It’s basically Tetris. In the Polycount mode, the patterned grid has numbers on it, and you try to rearrange the blocks to create patterns of numbers. In these modes, you should be able to double tap the patterned grid and rearrange the blocks with your finger. The double tap on the grid works well, but the drag and drop gesture is not accurate. It works sometimes, but it doesn’t on other occasions. When it does work, it doesn’t move as quickly or follow your movement. The thought and intention behind these play modes are exciting, but the tools to actually experience them are not there. The Grid 101 iPhone, iPod Touch, and iPad puzzle game has a great foundation with its Patterns and Chisel Chamber modes. The Pixel and Polycount modes could end up being the most fun and addictive with time and energy spent to improve the gesture controls. It is an extremely challenging game, but iOS puzzle addicts will be up for it. AppSafari review of Grid 101 was written by Jenni Ward on March 19th, 2013 and categorized under App Store. Page viewed 4733 times, 1 so far today. Need help on using these apps? Please read the Help Page.